As a hair salon owner we want all our clients to leave our salon feeling amazing. Whether you are having a colour, cut or a treatment, the end goal is the same, to give our clients a sensational experience, and a fantastic service. But there has been a problem looming in the background of this industry for many years; that problem is heat! Heat and hair do not mix well. We all know that too much heat can dry hair, causing damage and breakage. The problem is that in order to dry and style our clients hair we need to use hairdryers and styling tools. Sending clients home with damp, messy hair is not an option! As industry professionals we’ve all been trained to use our tools carefully in order to protect the integrity of our clients hair, for example, we never blast hot air from a hair dryer in one spot for too long. You may notice that when your stylist is blow drying your hair that they shake the hair dryer, the reason they do this is to avoid heat damage. Traditional hair dryers, in their current form have been around for about 50 years. Sure they come in a variety of shapes and sizes, but essentially they all do the same thing; blast out super hot air. In fact, many hair dryers can reach temperatures of 230 degrees celsius. Hair melts at this temperature! We all know this is a major issue, the problem is hasn’t been much we can do about it, that is until now. 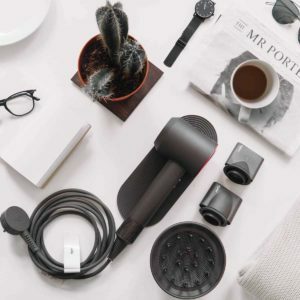 Dyson, the same innovators that changed the vacuum market, have now revolutionised the hair dryer market with the introduction of the Supersonic dryer. 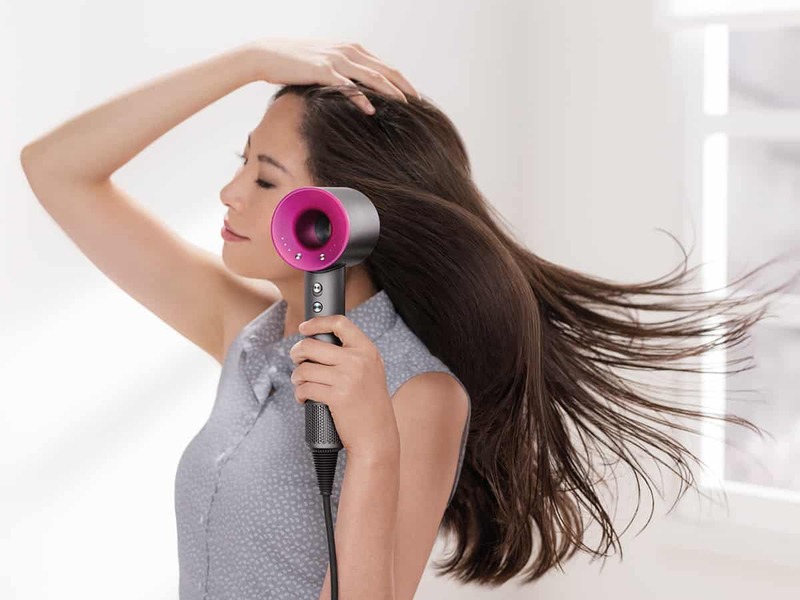 The new Supersonic dryer was developed with the help of leading stylists and includes features that improve the drying experience for both stylists and their clients. When we began using these new dryers in our own salon, we were blown away. Not only does the Supersonic look different with its unique shape and fashionable colours, the real difference happens when you turn it on. Immediately, all of our stylists noted how much quieter the Supersonic is than traditional dryers. 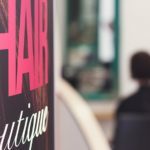 The overall noise level in the salon is much lower now and our stylists are able to hold conversations with their clients without having to shout. Since the air comes out at 105mph and reaches a whopping 6 feet in distance thanks to the wide air concentrator, we have been able to dry our clients’ hair in record time as well, which is a benefit for both us and them. Being able to work to time is a vital part of the job for any hairdresser, so having a hairdryer that speeds up drying times is a great benefit for us. By measuring the temperature twenty times every second, the Supersonic helps prevent heat damage to our clients’ hair and helps to protect its natural shine. Since traditional dryers can reach up to 230 degrees (the temperature at which hair melts), stylists usually have to keep shaking the dryer to ensure the client’s hair does not get damaged. But not with the Supersonic. Because of the speed of the air flow, the temperature doesn’t need to be as high to achieve fabulous results. The perks aren’t just for the clients. The Supersonic’s motor is located in the handle, which results in perfect weight distribution. This may not seem like a big deal at first, but when you’re a stylist drying hair all day long, the difference is significant. This dryer feels like a feather and makes our old dryers feel like a brick in comparison! In addition, the magnetic attachments are easy to snap on and off quickly, which means our stylists can move faster and our clients have less wait time. Because every second counts! Now that we’ve tried the Dyson Supersonic dryer, we will never go back to anything else! It isn’t cheap, but given the benefits, we consider it a worthwhile investment as part of your hair care tools. And you’re sure to feel the same way once you give it a try!